The summer weather is here and everyone is enjoying the sunshine. 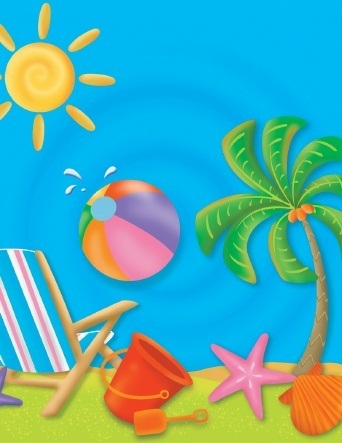 Enjoy the tips in the following newsletter as you go out and participate in all the fun activities that summer weather brings into our lives. Tips for a safe summer: We are all spending more time outside and in the sun, we need to respect the sun because it can be both beneficial and harmful. Here are a few helpful tips that you can use to protect yourself and your family as you increase your time outside. Remember the sun’s rays are the strongest between 10 am and 3 pm. If you are outside during this time find shade and if there is no shade, then apply sunscreen repeatedly. Monitor the amount of time you are out in the sun. Sun burns will not show up until several hours after they have happened. You might not be a lobster now, but later in the day you may show signs. Wear sun glasses as our eyes need protection from the sun. When buying sunglasses, style should not be as important as UV protection. Before buying sunscreen check out the Environmental Workers Groups list of safe sunscreens. And do not forget to read the ingredients, look for products that contain zinc, titanium dioxide and avobenzone or mexoryl SX. Use sunscreen creams rather than sprays as you and your children might inhale some of the spray. Do not forget to protect your lips while out in the sun. Apply lip balms that contain UV protection. Keep yourself hydrated by drinking at least half your body weight in ounces of water per day. If your kids are playing sports in the sun make sure you keep them hydrated to help keep their electrolytes in balance. Now if a sun burn should happen it is important to remember not to put any oil based products on the burn as the oil will cover the burn and not allow it to give off its heat. Rather the heat will be directed back down towards the skin making the burn worse. An easy trick to help take the sting out of a sun burn is to apply white vinegar onto the burn. To help soothe a burn apply 100% aloe vera to it. This is a great a great summer time drink for kids of all ages. Cut the watermelon up into chunks, place chunks into blender and blend. Add ice and mix until it becomes a “slushy” type drink. Garnish with mint leaves and enjoy. Some of my favorite drinks for the summer are simple drinks where you add fresh fruit to a bottle of bubbly water. These drinks are a great way to keep your family hydrated as you play in the sun.